My distractions continue--swimming and triathlon training are a bit off topic from this blog but that's where I've been. But a drive through the Finger Lakes and one of my last days of vacation have brought me back to my senses--meaning the smell, taste, and beautiful sights of our region. Don't tell my tri coach but I just had a dish of salted caramel ice cream at Cayuga Lake Creamery chased down by a wine tasting at Eleven Lakes Winery--both on route 89. Don't worry, because I'm still in training (taper no less), I took full advantage of the spit bucket. I hope to post more on Eleven Lakes soon but had to post a little something from the road. I love what they are doing--it was their Cab Franc that we used to wash down the amazing Zach pizza from Niles Country Bistro. We left today with a bottle of their Crooked Lake Red, a semi dry red blend. This one year old winery is one to watch. So let's say you're up trying to figure out what do this beautiful weekend and you haven't yet begun to fight the crowds at the Regional Market. Maybe you're sitting down to your first cup of locally-roasted coffee and know there's a lot to do but want to figure out how to squeeze in some foodie fun before Monday. Too often I find, the "problem" with living here in Syracuse is that there are too many possibilities. There are way more than I can keep track of. Over the last two weeks or so, I've bopped around a few of my favorite haunts in the Finger Lakes and so I offer a bit of inspiration for making the most of your weekend. Go to Geneva, NY and check out Normal Bread.. These beautiful loaves are the new darlings of the Finger Lakes. Pick up several loaves--they freeze well. Normal Bread will be closed for vacation beginning June 3 so this is the perfect weekend to visit. Heads up--they take cash and checks only--its a small, artisanal, one-man shop and worth the drive from the 'Cuse. Go to find out what winemaker Vinny Aliperti menas by "extreme winemaking" and then taste some. I couldn't leave with out a bottle of their Pinot Noir and their Apres Vidal Blanc ice wine. Feeling peckish? 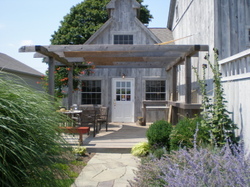 Skirt over to Cayuga Lake and get lunch and a wine tasting at Simply Red Bistro. Nestled among the Sheldrake Point vineyards, treat yourself to Samantha Izzo's creative menu using the best the Finger Lakes has to offer. Taste some Sheldrake Point wines on the way out and get some of their delicious Riesling Reserve. Cayuga Lake Creamery has the most incredilbe selection of hard pack ice cream and that's what I went for. But if you have kids in tow--or are a kid at heart, like my husband--you can't go wrong with their soft serve cones. From this point, it is so easy to keep cruising down Route 89 towards Ithaca. So swing right around the end of the lake and as you come back north towards Syracuse, you can make a brief stop in the cute town of Aurora and run into Bet the Farm. This is your chance to pick up wine, cheeses, crackers and other food stuffs from around the Finger Lakes, because let's face it: even if you wanted to, there's no time to stop at every one in one weekend. You need a good couple of weeks to get that job done. So Nancy at Bet the Farm has wine that you can't often find at the larger wine shops here in Syracuse--plus she's making her own wine too. Her Bet the Farm Traminette is my latest pick for a good, easy, summer white. From Aurora you can saunter up to Auburn and and take Route 5 on home. If you leave for your day trip now, you might make it back in time to hit the Riesling tasting at the Savvy Wine Cellar in Camillus--that ends at 5pm when they run out or close, whichever comes first--so you need to get going! Have a great day! The Savvy Wine Cellar--Guess Where? There are wine shops that I love to frequent. They are staffed with knowledgeable and passionate salespeople, the vibe is like a party with your newest best friends, and the aesthetics are both welcoming and sophisticated. Usually, getting to these favorite shops entails a drive down to Soho, Greenwich Village or a flight to Berkeley. This shop, however, is just 15 minutes from downtown...in Camillus. 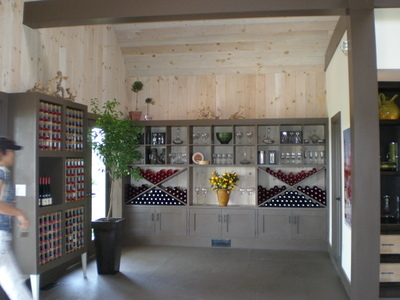 Don't let the suburban location fool you--The Savvy Wine Cellar is smart and urbane. How like Central New York, to put a wine shop like this in a location you'd least expect. But after only about seven weeks of business, their twice-weekly wine tastings have drawn repeat customers who are welcomed by name. Good luck finding a spot at the tasting counter--you might have to browse the shelves for a few minutes waiting your turn--as if that were a bad thing. Love the dedicated row of New York wines--a nice selection they hope to expand. The atmosphere is festive and open. This isn't the place to go to be intimidated and overwhelmed. 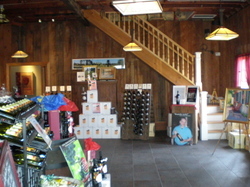 Wine Tastings take place Thursdays from 5:00 to 8:00 PM and Saturdays from 1:00 to 5:00 PM. Check out their website for specials as Riesling Month draws to a close. 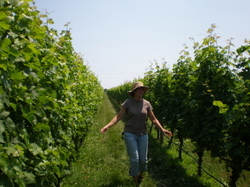 Staffer Neil Miller blogs on Finger Lakes wines at Stressing the Vine. Food, Wine, Art. These are a few of my favorite things. Next week Palate takes place in Corning, offering a true smorgasbord of wine tastings, special meals, art gallery openings, and more. And how cool is it that they come together in a celebration of the best our area has to offer. And it's in winter! Just the thing to break the monotony of dull, gray days. What's great about this week-long event is that once you get your Palate Pass you can attend just about all of the events throughout the day. If I could attend the entire week I would. As it is, I'll just be able to get a couple of jam-packed days in. I'll be blogging about it so if you can't get there check back here for some coverage. From left to right. Click on any photo to enlarge. Sticky bun from Artisan Cafe in Trumansburg. With a light and airy pastry, these buns are sticky but not cloying. I went for a bite and ended up eating the whole thing. Wake Robin Farm Milk. My milk of choice--creamy, rich, and delicious. Available on Saturdays at the CNY Regional Market. Thanks Meg! Upstate Harvest Granola. This is a breakfast granola, a snacking granola, an anytime granola. Just sweet enough--with flax seeds it's healthy too. A little bit of sea salt balances it out just right. Available at Nelson Farms and area food co-ops. Evans Farmhouse Creamery Butter. This is my "gold standard" of butter--it even ranked among the best in the world in a recent issue of Saveur magazine. Get it at the Syracuse Real Food Co-op. Smoked trout salad from Fins and Tails Gourmet Seafood shop on Pasta's Stretch Bread. This is lunch made easy because the good folks at Fins and Tails have already done the work. Also spotted at Fins and Tails--duck eggs! Ramps. 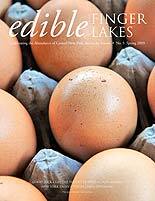 I got these from the Finger Lakes Family Farms booth at the CNY Regional Market. These will be turned into Deb Whiting's Ramp Pesto recipe featured in the Spring issue of Edible Finger Lakes. Hazelnut currant cream scones. There isn't a scone recipe I won't try. This is from a package of Bob's Red Mill hazelnut meal. Sure there's cream but no eggs or butter resulting in a tender, not too sweet, nutty scone. Golden Pheasant Wine from Pheasant Ridge Vineyards. This wine is uber local to the Syracuse area from grapes grown in Jamesville. This wine is a supple mix of grapes, apples and honey--it is yummy. Stumptown Roasters Coffee. This is the Nicaragua Los Delirios blend roasted on May 5. How good is this coffee? Stumptown is to the Pacific Northwest what Gimme! is to our area--careful, fanatic, serious coffee people. I carried this bag back from the Ninth Street Espresso stand at Chelsea Market in Manhattan. By the time my flight touched down back in Syracuse the entire plane was salivating for coffee. Early rhubarb from Blackbrook Farm in Seneca Falls. These are from Kendra and Paul who are known for their amazing greens--including those spicy wasabi greens. You can buy their seedlings at the Syracuse Real Food Co-op--watch for the sale on May 24--but this rhubarb is going into an apple pie. Teriyaki Pork Spareribs from Oink and Gobble Farm. I've been eating spareribs nearly every week since I've found these at the Finger Lakes Family Farm stand at the Regional Market. These are marinated in some of that Soy Vey Teriyaki sauces and broiled on a rack in the oven at 350 degrees until tender. A glass of Billsboro Riesling to wash it down makes me a happy camper. Sunlight, Chase and my tripod. I just love this shot because it represents play time for me. A little time learning how to manipulate light and shutter speeds, a tripod to keep the camera steady--and my buddy Chase who is happy to follow the sunlight all around the house. Archive Alert: On this date in 2007 I exposed my fridge for all the world to see. I love Mattituck. I mean, I could easily see living there--what with the ocean so close by, a charming Main Street, acres of farmland, and Shinn Estate Vineyards, what's not to love? We had the perfect afternoon to wrap up our 24 hours on the North Fork. 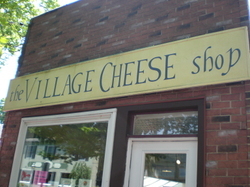 We picked up some delicious sandwiches, cheeses, and olives from the Village Cheese Shop. Every town ought to have a place like this--tons of beautiful cheeses in the case, including that incredible Ouray made by those Hudson Valley nuns at Sprout Creek Farm; yummy gourmet products to tempt the palate and the wallet, and a selection of good, crusty breads. This place would be on my weekly agenda if I lived anywhere near here. Lunch, however, had to wait a bit. 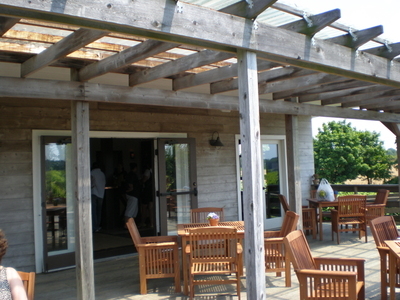 We were signed up for the vineyard tour of Shinn Estate Vineyards, led by co-owner Barbara Shinn herself. After eating at Barbara Shinn and David Page's restaurant in Greenwich Village, Home, last August, I couldn't wait to see the place that produced such fantastic wine. 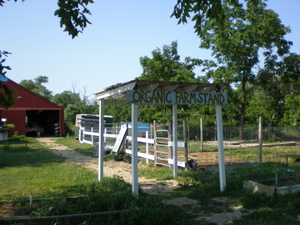 What was really special was the opportunity to see a sustainable agriculture philosophy lived holistically. Everything Shinn and Page does from vine to table is imbued with their reverence for the earth and passion for food and drink that ignites the palate. This commitment to sustainability is literally the foundation of all they do at Shinn. 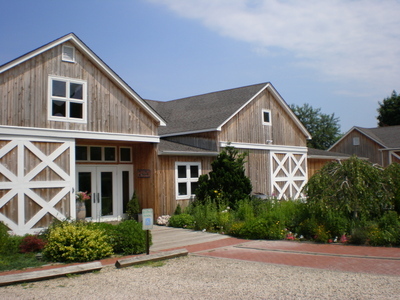 For starters, Shinn Estate is located on property that is protected by a covenant that will ensure that it will always be used for agriculture--so the effort to preserve Long Island's farming heritage in some form will last long past the current generation of owners. Before Shinn and Page came along the land that is now vineyards was previously planted with corn, rye and barley. Now, in addition to growing grapes they consider themselves clover and grass farmers too. Under each row of grapevines cover crops of native plants, clover, and grass help to enrich and feed the soil which in turn feeds the grapes. Their operation is over 90% organic and is proof that going organic doesn't mean sacrificing taste. Speaking of tasting, after the vineyard walk on that hot day all I could think of was wine and lunch. We ended our tour back in the tasting room where I tasted a fight of limited production wines. My favorites were the 2006 Sauvignon Blanc--this beautiful light straw colored wine offered nice grapefruit notes on the nose and a balanced mineral and citrus flavor on the tongue. I also loved the 2004 Cabernet Franc--just 175 cases were made of this wine--another argument for the development of this grape in New York. Lastly, there was that 2004 Reserve Merlot--a wine that could make me fall in love with Merlot all over again. It was very nice--typical merlot profile with just a bit of heat on the finish--could it be that splash of Cab Franc (11%) and pinch of petit verdot (2%)? Whatever it was, it was working for me. The perfect ending to all that walking and wine was our picnic lunch right outside the tasting room--did I mention that I could live here? This blissful 24 hours could have ended right then and I would have been happy but Lenn had one more winery for us to visit--Roanoke Vineyards in Riverhead. By way of introduction Lenn said, "I know you like small, artisinal producers". How could we pass it by? Roanoke's tasting room has only been open three years but it clearly has a dedicated following. Like Corey Creek, Roanoke shares a vineyard manager and winemaker with Wolffer Estate so we had the opportunity to taste some of their wines as well. In fact the Wolffer 2003 Reserve Chardonnay ended up being one of the purchases of the day. I also liked the 2006 Rose--it actually had some lemon notes that drew me in. However, the purchase of the trip--the purchase that made the whole excursion worthwhile--was the 2001 Grapes of Roth red, named after winemaker Roman Roth who had the opportunity to "do his own thing" to fantastic results. This Merlot already had a lot of buzz with talk of how Long Island could compete with California with reds that were cellar worthy. Well, believe the hype. This was a mature and complex red, balanced, not too fruity, and if you've ever wondered what drinking the finest velvet might be like--this is it. A sign too tempting to pass by. 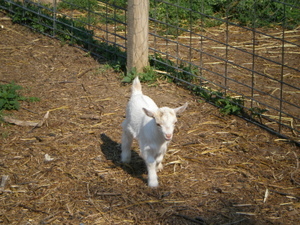 Two week old lambs goats---too cute! Archive Alert: On this date in 2006 I was tasting wine at the New York Wine and Culinary Center. After a good night's sleep my friend Steph and I feasted on an old-fashioned breakfast at the Riverhead Grill. This is the kind of place where the orange juice is served in small amber-colored glasses and the eggs automatically come with home fries and toast--hearty and comforting--a great way to begin a full day of wine tasting. We headed east from Riverhead to our first stop at Paumanok Vineyards. 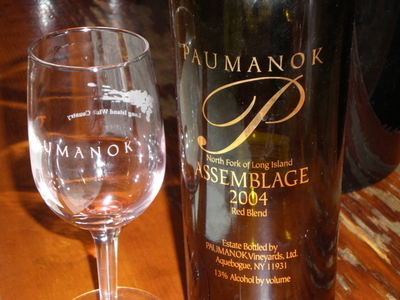 Paumanok has been around since 1983 and specializes in old world style vinifera wines. I picked up a really nice bottle of their 2006 Chenin Blanc. We enjoyed it last week with friends over dinner on a warm night and it was just the ticket--we had other bottles open but this one went really nice with the garlic and lime marinated pork chops we grilled and served with a peach/tomato salsa. The other key purchase was a delicious red blend--the 2006 Assemblage--their version of a meritage wine. Seeing how the day was going to progress they gave us an empty case-sized box to hold our purchases. 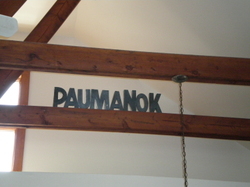 We found Paumanok to be a nice, easy going tasting room with beautiful views of the vines. As it was early in the day--11:00 am, there weren't too many people there when we arrived but the large group coming in as we left signaled the popularity of this vineyard. It was a perfect way to begin our introduction to the North Fork. Okay, perhaps I should have taken this shot with the wine in the glass...but it was early, folks. A view from the Paumanok deck. The renovated barn that houses the light and airy tasting room was originally built over 100 years ago. 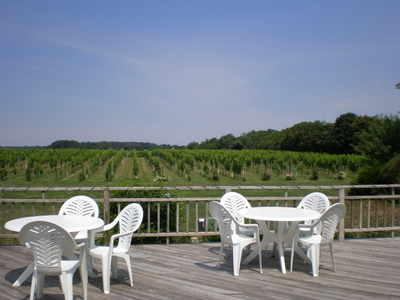 After Paumanok our next visit was to Corey Creek Vineyards in Cutchogue. Corey Creek is owned by the same folks who own Bedell Vineyards so we had the benefit of being able taste some of the Bedell wines as well. I was thrilled when Lenn recommended this winery because I had been intrigued by them ever since Bon Appetit magazine did a piece on them about two years ago. This was a hard place to be on a limited budged--I loved so many of their wines--the 2006 Domaines CC Rose, the Raspberry dessert wine, and the 2006 Guwurtztraminer were stand outs. I ended up leaving with the Raspberry dessert wine which was surprising because I usually don't like these. But this one was more mature--lacking that cloyingly syrupy sweet taste that many fruit dessert wines offer up. Again, thanks to Lenn, we also snagged several bottles of their sold old Guwurtz--the coup of the day. This was a popular place at around noon when we were there and I was super impressed with the wonderful attention we received. We hung out on their deck for a while enjoying the view and plotting how to get some North Fork real estate. 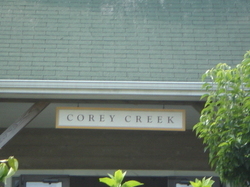 The Corey Creek Tasting Room. The beautiful deck at Corey Creek. In the final installment I discover that vising Shinn Estate is like coming home and am wowed by the reds at Roanoke. Archive Alert: On this date in 2005 I was just beginning my first Eat Local Challenge--the 2007 Challenge begins September 1! I was also enjoying a very lazy meal. On this date in 2006 I updated the design of the blog a bit--anyone remember the eggs in the banner that looked like loaves of bread?? ?